From the Nita pass parking lot, there is a ropeway to Mt. Myokendake, with an elevation of 1333m, providing easy access. The view that expands underneath you while walking at 1300m above sea level is extraordinary. 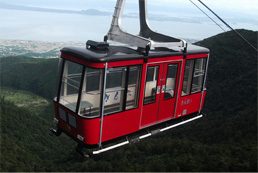 With a difference in elevation of about 174m, and at a distance of about 500m, the ropeway connects Nita pass station to Mt. Myokendake station in about 3 minutes. The cars come equipped with large windows so that you can see near your feet, and operate on a triple rope system. Spring arrives at Unzen around early May, and the Mitsuba azaleas bloom either at the same time or a little earlier than the leaves. 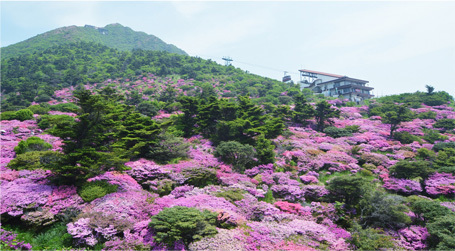 Unzen's azaleas include the Mitsuba azaleas, Hikage azaleas, Miyama Kirishima azaleas, and Yama azaleas. Blooming a little after the Mitsuba azaleas on the rocks at Mt. Myokendake in a pale yellow color are the Hikage azaleas. Around the Jigoku are clusters of Miyama Kirishima azaleas, called Houbaru and Ikenohara, blooming vividly in mid-May, and in a brilliant shades of red at the Nita pass. Summer at Unzen is cool, typically around 21℃ to 22℃, and has been known as a summer retreat, and has been visited by people both in and out of Japan. 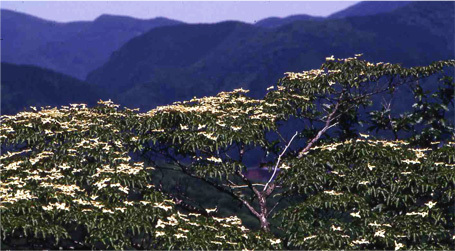 In the summer, the mountain is covered in dogwood flowers, and is especially eye-catching. Furthermore, when you climb Mt. Myokendake, you can see the “3 peaks and 5 mountains of Unzendake”. The view, while you feel the breeze cutting through the valleys of Mt, Fugendake, Mt. Myokendake, Mt, Kunimidake, Mt. Kinugasa, Mt. Takaiwa, Mt. Nodake, Mt. Yadake, and Mt. Kusenbudake, is exceptional. The autumn leaves include the leaves of Komine maples, Urihada maples, Kouchiwa maples, Uri maples, and Doudan azaleas, which turn a beautiful yellow and red. 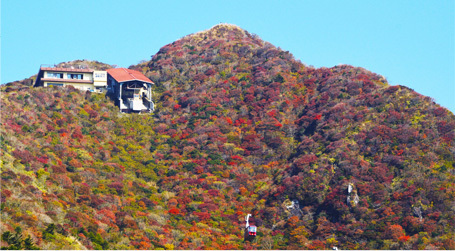 Designated as a national natural treasure, known as the “Fugendake autumn leaves forest”, there are over 120 species of autumn leaf plants. However, it is of concern if they will wither away if Mt. Fugendake erupts. The conditions for seeing beautiful autumn leaves are having a large difference in temperature during the day and night, and that they absorb enough ultraviolet light. Hoarforst is made by mist and fog freezing on to trees by being blown by winds several degrees below freezing, and is known in the region as “Hana bouro”. Predominantly observed on the northwest and northeast sides of the mountain. We recommend climbing Mt. Myokendake and take the nature trail to Mt. Kunimidake. Furthermore, it is necessary to have proper equipment on your feet when there is snowfall. The first hoarfrost can be as early as mid-November, and in recent years, as late as early December. 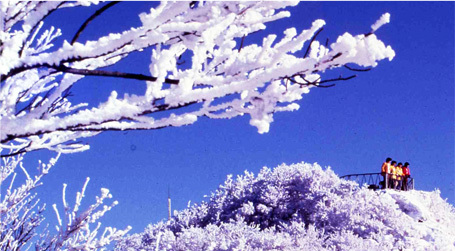 You can enjoy the Nita pass all year long, with Miyama Kirishima azaleas in the spring, dogwood and fresh greenery in the summer, autumn leaves in autumn, and hoarfrost in the winter. 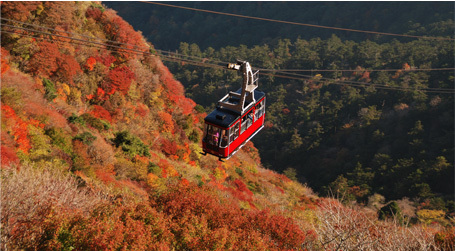 You can enjoy the changing features of the mountains and the spectacular view of nature while riding on the ropeway.